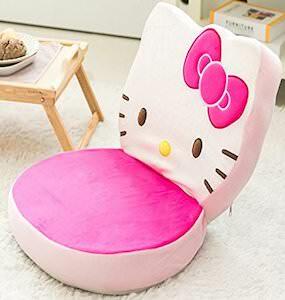 If you like Hello Kitty and sitting on the floor then you should check out this Hello Kitty chair. This is a chair without legs as it is a Hello Kitty floor chair with a pink seat and the back of the chair is the face of Hello Kitty complete with the bow in her hair. And when you want you can fold the back flat making even more comfy to lounge on and easier to store when you are in using it. Kids or adults that like Hello Kitty can now sit more comfortable on the floor as the seat is just comfy while being almost on the floor.